The Nevada Supreme Court ruled Tuesday that each political party can select one candidate to run in the CD-2 special election, overruling Secretary of State Ross Miller's "ballot royale" interpretation of the election law. 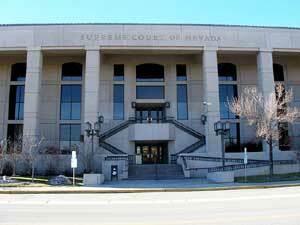 State and congressional candidates may face a difficult time plotting their campaign strategies because Nevada's redistricting maps could be stuck in the courts until next spring, according to the Las Vegas Sun. If the court battle does drag into next spring, candidates will not know the location or voter registration make-up of their district until a few months before the 2012 elections. In the first six months of 2011, the Republican Governor's Association has raised $22.1 million and the Democratic Governor's Association raised $11 million, according to Politico. Since the associations are not federal committees, both can raise unlimited contributions and corporate money. On Monday, the White House released their list of employee salaries. According to USA Today, total pay for all employees is $37 million and nearly one-in-three employees earns over $100,000.